Star Wars: The Force Awakens is finally coming home! After a grueling 4 month wait, this blockbuster sequel will be available on VOD starting April 1, and then on April 5 it comes to Blu-ray and DVD packed with extra features. Probably the most anticipated of these are the 7 deleted scenes. While we've seen the titles of the footage before, EW has the first look at what hit the cutting room floor, along with details about what we can expect to see. And some of it is pretty cool! About the 7 deleted scenes awaiting fans, director J.J. Abrams had this to say. "There are so many things that end up getting cut because of the greater good, because of the rhythm of the sequence or the need to get on with it, a sense of redundancy. You don't know any of these things when you're making the movie, of course. It was sometimes after months of working on something that you realize finally - you just don't need it." The first scene on the Blu-ray is titled Finn and the Villager. It was planned for early in the movie. FN-2187 has not yet gone AWOL, but Finn is not sure about the First Order. As the troops round up the villagers during their raid on Lor San Tekka's village, a conscience-stricken Finn has an intense moment with a woman hiding in the shadows of a small building. He's ordered to kill her. As he raises his weapon, he decided he must take a stand against his oppressors and fight the greater good. You'll have to watch the scene to find out how this moment ends. Probably the coolest deleted scene coming our way has Maz Kanata, Han, Finn, and Chewie facing off against Stromtroopers in the basement of Maz's Castle. This scene is only availably digitally, but the Blu-ray combo pack comes with a free download, so if you purchase a hardcopy, you'll still be able to get it. Here, we get to see a little bit more of Han Solo's iconic swagger as he tries to talk his way out of trouble. There is a moment that got cut out of the final movie which features Chewbacca ripping the arms off of Unkar Plutt inside Maz's castle when the Jakku junk boss comes to collect Rey. We're not sure if this scene will be included here. 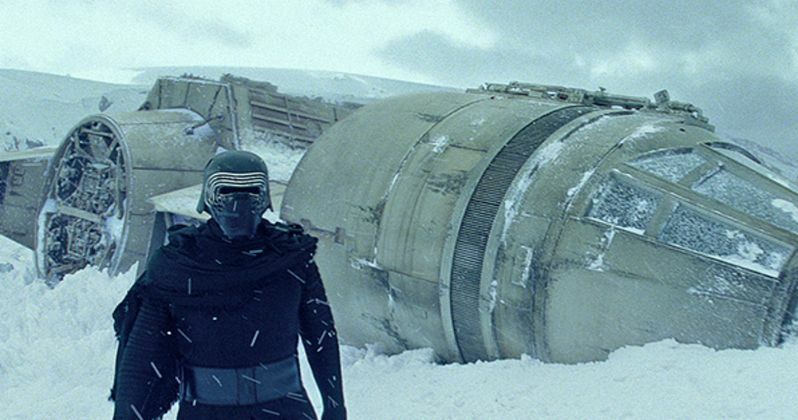 In the third deleted scene titled Kylo Searches the Falcon, which we got a sneak peek of in the Blu-ray trailer, Kylo Ren and his squad of Snowtroopers discover the Millennium Falcon crash-landed on the surface of the Starkiller Base. Kylo searches the ship, where he is faced with old memories from his childhood, back when he was known as Ben Solo. He obviously spent some time here, before he was pulled to the Dark Side. And he knows his estranged father is conspiring against him. About having to cut this and other scenes, J.J. Abrams explains. "You never go into a day of shooting and say, 'This is probably going to be on the cutting room floor. Every day feels as essential as anything else. It's always annoying to realize that you wasted anyone's time on shooting something that wasn't necessary." The director goes onto explain that these 7 deleted scenes do not change the story as it is presented. But they do deepen our understanding of these characters, and give us a better look at their intentions. The deleted scene titled Jakku Message actually introduces Carrie Fisher's General Leia earlier in the movie. She must decide her next move after The First Order has massacred the innocent bystanders in Lor San Tekka's village, and Poe has been captured. This moment gives us more of Emun Elliott as a Resistance communications officer named Major Brance. Known for his role as Marillion in Game of Thrones, his character here receives a distress signal from BB-8 informing General Leia and her army of the attack. This is followed by a deleted scene titled X-Wings Prepare for Lightspeed. Here, we get to see Poe Dameron as he leads his squadron on an attack against the Starkiller Base. And it shows the X-Wings in space, as opposed to just within the atmosphere of a planet. In Snow Speeder Chase, Finn and Rey hijack a Snowspeeder while on the Starkiller Base, with a Snowtrooper giving chase. This scene is important in that it shows how the pair wound up in the woods for their snowy fight against Kylo Ren. In the final deleted scene, which is titled Finn will be Fine, we see Rey back at the Resistance base, where she gets an update on Finn's condition after being struck in the back by Kylo's lightsaber. This scene features Downton Abbey's Harriet Walton as Dr. Kalonia. You can take a look at some of these deleted scenes, along with some new behind-the-scenes photos in our new gallery below. What do you think? Still excited to see these missing moments?